My garden focus seems to shift every year or so. One year I'm totally into veggies, the next it's berries and fruit trees, and then I switch to focusing on my medicinal garden. At the moment, I'm really into my medicinal garden. The last three plants I bought are medicinal and I have plans to expand my medicinal garden this winter and spring. Some of my favorite medicinal plants to grow are elderberry, calendula, plantain, yarrow, borage, and comfrey. I wrote an entire post about why I love elderberry so I won't write about elderberry today. You can read that post here. Calendula (Calendula officinalis) is one of my favorite plants to grow. Why? Calendula flowers are like little pops of sunshine! Their sunny rays come in a rainbow of yellows and oranges and can be used for so many things. I love to pick the flowers and scatter the petals in my salad, make a tincture out of the flowers, soothe a gardening wound by directly applying a flower to it, and dry the flowers for salve. 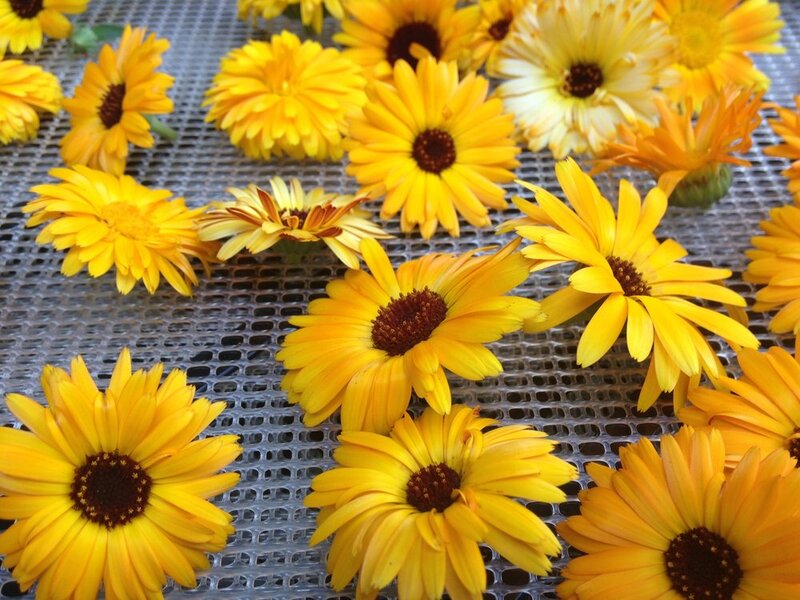 Calendula is a great first aid plant for wounds, burns, bruising, strains, and inflammation. Calendula is very easy to grow. It's a self-seeding annual that has taken up residence in my Portland garden. I let it self-seed freely so that I never need to replant it. If you remove the spent flowers, it will continue flowering. Plant this sunny, happy plant in a children's garden because it is very forgiving and is a wonderful plant for your little one to learn for minor bumps and bruises. Another favorite plant of mine is plantain (Plantago major and P. lanceolata). Some might argue that it's a weed, but that really depends on how you define "weed". At the U of MN when I was studying horticulture and landscape design, I remember learning that a weed is simply a plant out of place. I think of plantain as a bonus medicinal plant growing all over my garden. It tends to like poor soil and since our yard was pretty neglected when we bought our house, I can understand why we have quite a bit of it growing here. There are two species of plantain (narrow leaf and wide leaf) and both can be used medicinally. I like to use plantain as first aid for bites and stings. I've been known to have friends and family members chew up a couple leaves and put the wad of plant material on a bee sting. It works wonders - just make sure you are putting clean plant material in your mouth... picking it from the side of the road within dog-range isn't the best idea. I also harvest plantain leaves when the plant is flowering, dry them immediately to maintain their color, and use them in my healing salve, along with calendula, comfrey, and a few other amazing healing herbs. Yarrow (Achillea millefolium) is another plant that pops up all over my garden. The native species in this area has white flowers, but there are several species available at garden centers that come in shades of yellow and pink. I have planted yarrow in a few areas of my garden and also find it volunteering in many places, including the grass. I let it wander and would love for it to take over the little grass we have left on day! I prefer the native yarrow for medicine making. The whole plant is very aromatic and has a distinct smell. My favorite uses for yarrow are for cuts and scrapes to help stop bleeding and as tea for fevers. Yarrow is a bitter plant so be prepared for a hot cup of aromatic, bitter tea! As I'm writing this, I am realizing that my (current) favorite plants tend to be the plants that either self-seed or volunteer in my garden. Sticking with that trend, the last two plants on my list are borage and comfrey. Borage (Borago officinalis) is a medicinal plant that I'm still getting to know. I have it on my list simply because it has irresistible blue star-shaped edible flowers... and because it self-seeds and is filling in an empty spot in my garden and that makes me smile. In the herbalism program I completed a few years ago with Arctos School of Herbal and Botanical Studies, one thing I remember about borage is "borage for courage". The blue star-shaped flowers can be used when courage is needed. Eat them right off the plant, pick them to add color to your salad or lemonade, make a tincture, or impress your friends with a some unique edible flowers on their dessert! I have yet to use borage leaves or seeds medicinally. Comfrey (Symphytum officinale) is in the same family as borage (Boraginaceae) and is an enthusiastic garden friend. If dug up, any little piece of root remaining will likely become a new plant. Since I am constantly moving plants around in my garden, I decided to leave this one in a pot. Comfrey has large, scratch leaves that are a great mulch. Chop them up and drop them in your garden for easy soil improvement. Medicinally, the leaves, root, and rhizome can be used. It is best known for it's enthusiastic healing properties. In fact, it can heal so quickly that it should not be used on deep cuts, because the outer layer of skin could heal right over the open wound below. I dry the leaves for salve, steam fresh leaves to use as a poultice for pulled muscles, shallow wounds, and to help prevent scarring from minor wounds. I'd love to hear from you! There are so many more great medicinal plants to explore! What are your favorite medicinal plants and how do you use them? Where do you get your medicinal plants: from your garden, dried from the store, wildcrafted...?